5cc syringe w/ tip and plunger contains 15 grams. This is a low temp solder paste with a no clean flux. This alloy has an advantage over similar products on the market because the 1% Ag provides more strength and is less brittle than SN42/Bi58. 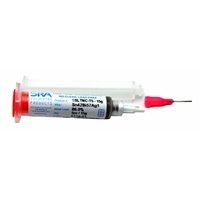 Protect Sensitive Parts with this low melting Lead Free Solder Sn42/Bi57/Ag1. Melting Point 137 C 278 F (Eutectic). 86% Metal. Particle Size T5 (15-25 Microns).